This first post will probably be heavily edited in the coming few days as I rough out the story for the AU somewhat better. For now, it's mostly placeholders, though I hope that'll be enough to provide some interest for the moment. New Saxe-Weimar-Eisenach initially consists of two island groups - the very first island group is South Georgia and the South Sandwich Islands, purchased from the British in the 1860s. Pepys Island was discovered on the way to colonise South Georgia in the early 1870s, with the result that South Georgia's colonisation was delayed until the early 1880s. Saxemburg Island and Thompson Island were discovered in the 1890s, Saxemburg being of relatively little consequence - the island itself is only 25 square kilometres, but Thompson Island, about halfway between the Pepys Island Group and the South Georgian Island Group in terms of size, is soon found to be rich in minerals, though unlikely to ever be self-sufficient in food. The four islands \ island groups of New Saxe-Weimar-Eisenach form a loose chain across the South Atlantic, anchored on Pepys Island and Thompson Island, with Saxemburg Island and South Georgia and the South Sandwich Islands relegated to secondary importance, though the South Georgia Island Group's whaling industry provides a generous income even in that industry's declining years. The Pepys Island Group, eventual destination of the original colony ship, is the site of most of NSWE's heavy industry, most of it concentrated in New Saxony, with ship building concentrated to the north of New Saxony on the edges of Brandenburg Sound. In the 1890s and 1900s, New Saxe-Weimar-Eisenach's economy is mostly centred on gaining self-sufficiency, both agriculturally, with farms springing up on the shelter of the Hamburg Mountains on the northern island of New Lower Saxony and the beginnings of a fishing fleet operating from the multitude of bays and sounds across the shoreline of the Pepys Island Group. Close ties are retained with initially Saxe-Weimar-Eisenach and later, Germany, particularly helped by the trade in whale oil and Thompson Island's mineral wealth, with NSWE's Navy starting to form in the early 1900s as serious trade shipments start to commence. The trade is two-way, however, with experts from Krupp helping to build the railway across New Saxony's industrial belt and establishing their own works there. The House of Friedrich, conscious of their own low population, invests heavily in education to extract the highest value possible from each subject, drawing immigrants mainly from South America and Germany as the standard of living increases. World War I results in NSWE being largely shut out from the European market, the British letting the House of Friedrich know the consequences of supplying the Germans with crystal clarity, so instead NSWE concentrates on the South American trade, where it starts to compete with Denton for customers, more-or-less winning over the German-leaning Argentinian trade but with less success in Brazil and Chile. NSWE's earlier frenetic expansion of heavy industry places the country in a good position to provide "value-added" services to most of the South Americas, with NSWE consulting engineers becoming an increasingly frequent sight on infrastructure projects across the South American continent as the Great War rumbles on to the north, quietly aided and abetted by the US, who are attempting to penetrate the German industrial and military establishment at a remove, but also because NSWE is officially neutral - with the US declaration, the South American nations become leery of anything that could be seen as picking sides - yet not strong enough to compete with the US should the House of Friedrich get ideas above their station. With the conclusion of the War and the 1918 influenza pandemic, NSWE, rich from trade with South America, still largely wide-open spaces but with approaching European or American standards of living, introduces a rigorous quarantine program and shamelessly casts about for immigrants fleeing the death and destruction of the Old World, straining NSWE's economy to the limit as they try to accommodate the influx of new people, finally starting to get proper populations on the Thompson Island Group and the South Georgia Island Group, which, in turn, increases the minerals output from the Thompson Island Group. The Great Depression almost comes as a relief to NSWE, forcing it to turn investment inwards in a Keynesian attempt to buy their way out of recession with an enormous public works program, bridging the Brandenburg Sound and linking the railway systems of New Saxony and New Lower Saxony, replacing the ferries that had operated, building an entirely new naval dockyard on the Brandenburg Sound shore of New Lower Saxony and building highways across the plains and through the mountains of NSWE. Basic industrialisation starts on both the South Georgia Island Group and the Thompson Island Group. Fortunately, NSWE's emphasis on industrialisation keeps most of the money circulating within NSWE's economy rather than flowing outwards. By the late 1930s, NSWE has become something of a beacon of progress in the South Atlantic region, already starting to spend more money on the military to protect the valuable jewel from outside interests. As Europe starts to slide towards war again, the House of Friedrich, confident of their new strength to the point of arrogance, start to assess their own place in the world. The Third Reich's Anschluss had not gone un-noticed by the House of Friedrich, who viewed the Falklands as both threat and opportunity - the Royal Navy station there could be troublesome if reinforced, but if NSWE could take the Falklands the British would struggle to take it back without assistance from South America. 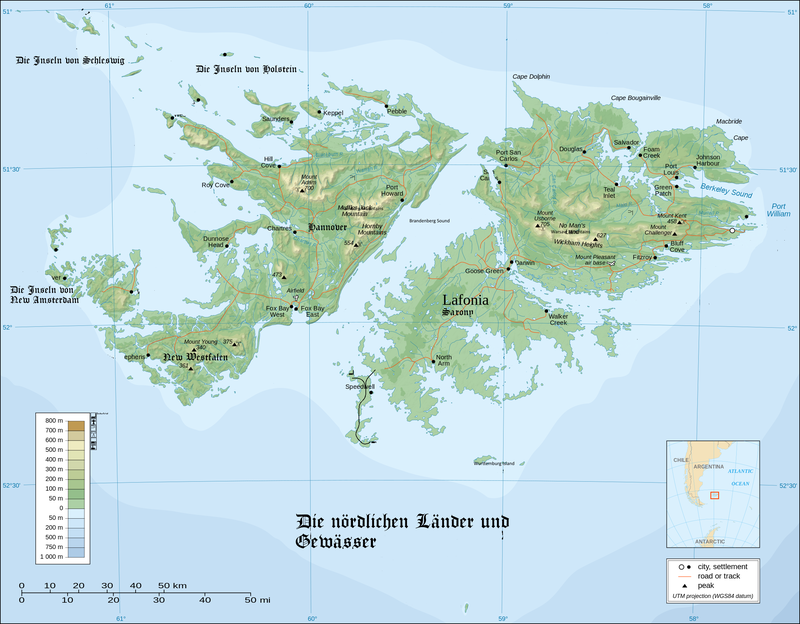 Germany's takeover of the sudentenland takes place without any apparent change to the outside observer, but, internally, NSWE's councils are hardening in favour of taking, rather than asking for, the Falklands. As word of the war erupts in September 1939, the British facilities in the Falklands are surrounded and captured by NSWE, Fallschirmjaeger deploying from airships starting the assault, drawing the British defenders away from the coast, which was then taken by NSWE troops and armour. NSWE started developing torpedo boats in earnest once they'd acquired their new heavy torpedo - like Imperial Japan, NSWE's strategy planners had long recognised that any nation big enough to seriously threaten NSWE could crush it utterly in an equal fight, so had started investigating the more asymmetric forms of naval warfare. NSWE's first series production torpedo boat wasn't actually produced in NSWE, the S-Boot Ausf.1935 was designed and built in Germany to NSWE Bauamt's specifications. As such, it's a slightly smaller craft than the KM S-Boot, with in service restricted to carrying two torpedoes, although it does have racks for another two - the two 610mm torpedoes weigh almost as much as the KM S-Boot's maximum load of 4 533mm G7a torpedoes, the weight of four torpedoes rendering the smaller boat sluggish and only marginally stable. The size and, particularly, the engines, doom these craft to a short service life - once NSWE standardises the Modula engine diesel variants, the S-Boot '35's Daimler-Benz MB501s make it the odd one out in the supply chain. Plans for a followup model, big enough to carry reloads and powered by home-grown Modula diesels, soon follow. If the CA '41 design represents the most useful design from the Bauamt in the war, the CAAA '42 Drachenodem certainly represents their most ambitious. Armed with 4 149.1mm Drachen 150 rotary mounts as the primary weapon, this short-lived ship could never withstand the strain that it's own weapon systems placed on the hull. While the Drachen mounts were effective against both air and surface targets (though in the Drachenodem's only surface engagement it was only engaging CL and CA, not ships of a comparable size to itself) they proved vulnerable to an unexpected enemy - hull stress exacerbated by the oversize barbettes for the Drachen mounts. After a particularly savage storm the Drachenodem developed a crack in the hull alongside "Bruno" turret and was condemned after a hull survey shortly thereafter. By this point, armistice signed and war reparations due, the Allies inspected the ship but declined to take it as a war prize, apparently quite relieved that the ship that had caused such a disproportionate amount of damage to allied materiel in fact bore a fundamental flaw of its own. Last edited by apdsmith on September 22nd, 2016, 8:01 pm, edited 28 times in total. Looking forward to more as well. Is there a reason to have two different types of seaplanes in the navy? An alternate version of what became Bauamt's CA'41, this twelve-gun heavy cruiser retains substantial similarities to the eventual design, retaining the entire motive power and electrical plant and stern arrangements. Eventually rejected due to the increased cost, increased crew requirements, even with the same extensive (and expensive) automation present in the CA'41 design and because the new Bruno turret in fact complicated the AA firing arcs for the 128mm DP guns. Next: On to FD scale for that plane! Last edited by apdsmith on May 22nd, 2015, 1:05 pm, edited 1 time in total. Very nice Ad! One thing that has been bugging me that I never was able to figure out till just now was the turret size. For triples I'm not sure those turrets are big enough compared to the Admiral Hipper's doubles. I assume they're wider, but I also think they should be a bit longer and taller than the Hipper's that they appear to be based on. They're actually derived from Scharnhorst, but, now that you mention it, they are a little short, aren't they? 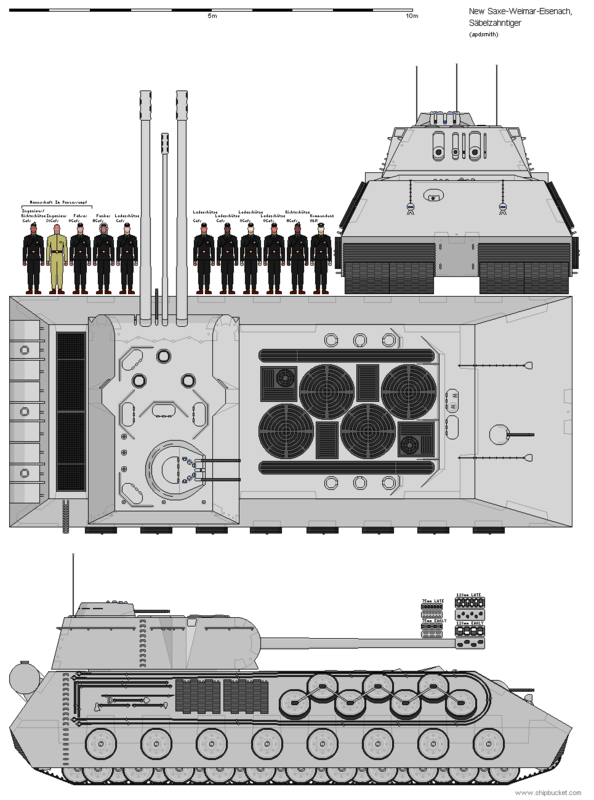 Barbette should be fine, the Hipper twins need 51 px in the barbette, which this turret has for all three guns (assuming Hipper's 216cm between axes), but it's a bit front-heavy. 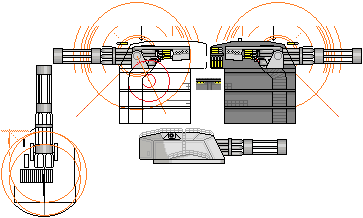 Will re-do the turret. Just FYI, there is a 203mm triple turret on the German parts sheet. Never left the drawing board, so it's pretty detail-less, but maybe you can you it for inspiration. The cruiser looks great, btw, Nice Work! You could also check the KM partsheets for some updated versions of the smaller optical equipment (directors, binoculars,etc...). You might want to remove some orange pixels, that are scattered around on your templates. This is the fleet standard observation plane, officially entitled the Fleet Observation Corps Model 1937, mod 39 (as in "1939", not "39th"), known universally as "Gewächshaus" or "Greenhouse" due to the acreage of glass. Powered in initial versions by a license-built copy of the BMW 132 radial and in later versions by the 700-kW variant of the Modula 9 series radial engines. Armament is rather underpowered, with a pintle-mounted MG81Z aft and a fixed MG81Z forward. Crewed by a pilot, navigator and radio operator \ rear gunner, the replacement of the bomb bay in the centreline float with an extended-range fuel tank in the Ausf.39 permitted this a long reach and longer loiter times when used for gunnery spotting. Almost entirely unarmoured and woefully under-armed, Greenhouse pilots learned early on not to engage, well, anything, particularly as the only way to re-load the front MG81 if the pilot should be fortunate enough to survive any length of time in combat was for the rear gunner to cease defending the rear of the aircraft, turn, and reload the belts by hand! Despite these significant shortcomings, the Greenhouse remained in production for the duration of the war due to the sheer simplicity of the airframe and the impressive endurance the plane offered, these being regarded as the key points in a scout plane. Any comments? I've just realised I've not put the wing floats on, but apart from that, and, of course, tidyup, with the SB-scale and the scaled-to-FD left on as points of comparison. 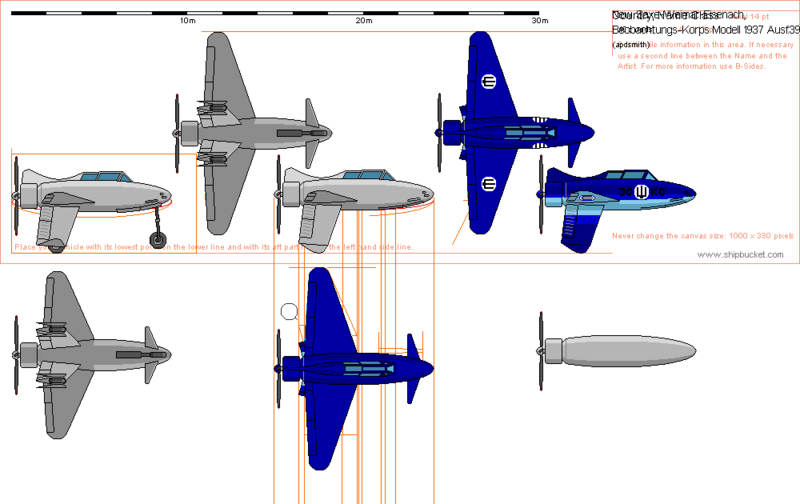 Also left off is the Marineblau Gegenschattierung camo scheme, primarily for clarity while I'm doing the actual plane.